Chankanaab Beach Adventure Club is located inside Cozumel´s National Marine Park with the Chankanaab Lagoon which was declared a National Park in 1980 as a protected area for the flora and fauna and marine life on the West Coast of Cozumel. 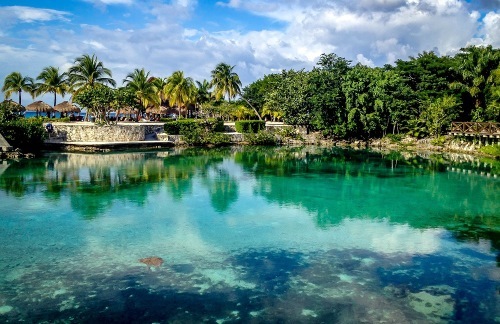 The natural lagoon in the centre of the park gives it its name Chan meaning small and Kanaab meaning sea in Mayan. Chankanaab is focused on environmental conservation whilst at the same time offering a rich diversity of activities with its botanical gardens, home to 350 species of tropical plants and the inland lagoon which is home to diverse corals, fish and crustaceans. The park has a beach which is raised above sea level by a rock wall which lines the cove and in the snorkel area you will find abundant marine life and submerged statues making it a fabulous experience to snorkel or scuba dive. Facilities include showers, lockers, a volleyball court, a relaxation area with hammocks and a children’s play area. They also have special sand wheelchairs for the handicapped. Guided tours are offered free of charge through the archaeological park where you will see a Mayan village and replicas of archaeological sites throughout Mexico. The interactive Natural History Museum is a must see! There are also extra activities you can book as swimming with dolphins or SNUBA. We highly recommend a visit to the Chankanaab Lagoon as part of your Cozumel vacation to appreciate the stunning beauty of the island.